Mod: With community preservation and the architectural legacy of Sierra Madre being such a big issue in this election season, which by the way ends tomorrow, I thought it would be a good moment to step back and take a little tour of something you might not have noticed all that much before. This comes to us from a notable local blog that deals with architectural issues called Industrious Lily (link). 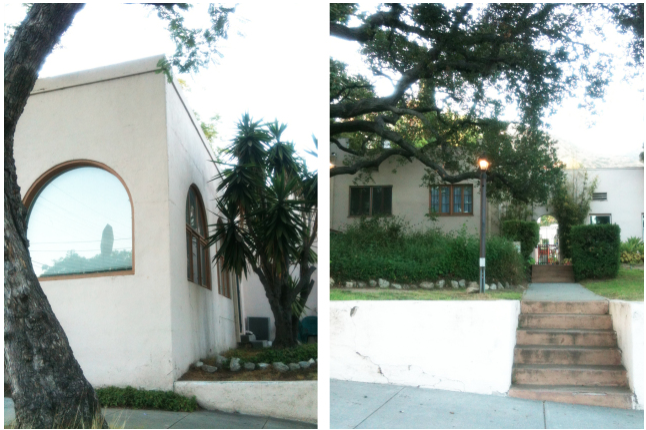 The article, written in 2012, is called Irving Gill’s Lewis Courts, which are found right here in Sierra Madre. 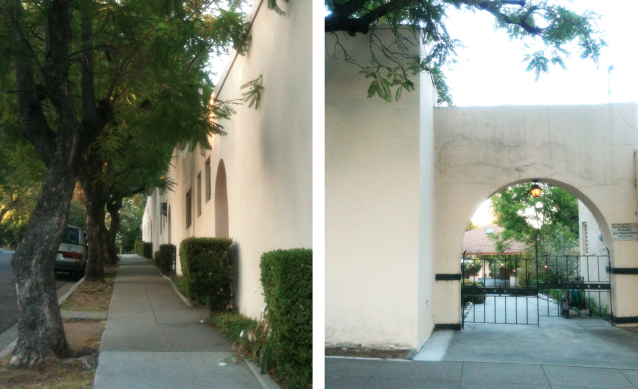 Irving Gill's Lewis Courts - Growing up in San Diego, I have had the pleasure of seeing much of Irving Gill’s architecture in person. From various residences to the Women’s Club and my middle/high school in La Jolla, his work is so reflective of the tenants of simple, modern design. 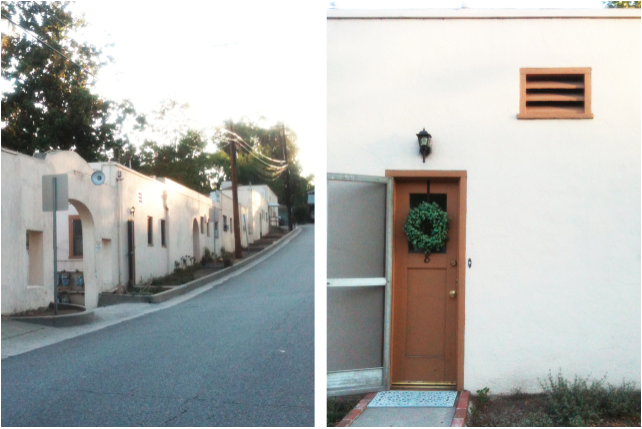 Moving to Sierra Madre, I loved to drive around and one day drove up Mountain Trail and saw a row of buildings that looked very Gill-like to me….. Run home, google, and yes! The Lewis Courts, one of his first “social architecture” projects (built in 1910) still stands here in our small town. Sadly, as is the case with so much historic architecture, the courtyard-style apartments are only a small reflection of what they once were. The courtyard, around which the complex was designed and oriented, is now filled with a large post-war apartment building that is incongruous in both style and scale. Peeling paint and cracking stucco also tell of the years of wear and tear that the buildings have endured. But there is life there still - good bones, great lines, good light …. and people are still living and using the buildings every day. That is significant, and comforting. Also impressive, these apartments were designed and built before our 1912 bungalow, and yet they look modern, current and timeless. Interesting. If you are ever in this neck of the woods, drive up Mountain Trail, almost to the top, and you will see them on your right…best seen in the early more or dusk, in my opinion. Worth the drive. Mod: There is an interesting Facebook page called So Cal Historic Architecture (link) that also discusses Sierra Madre's Lewis Courts. Here is what site owner Linda Hammonds has to say about this interesting slice of local legacy. Irving J. Gill saw such small houses as the embodiment of economic democracy. While he had no control over the cost of the land, he did control the cost of construction. Gill believed modern materials and building techniques would lead to affordability, and he experimented with different variations of this approach through the early 1900s. 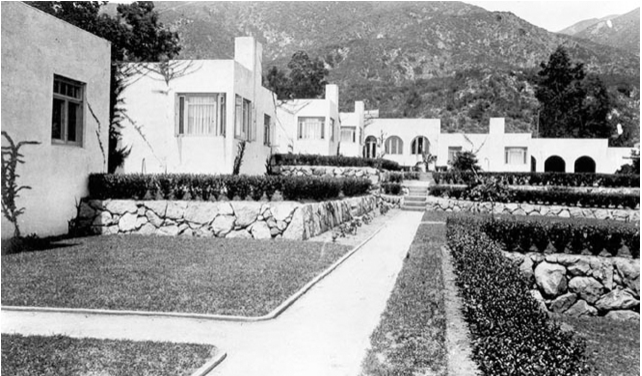 Lewis Court in Sierra Madre is one of his most notable examples from this period. Built with concrete floors and terracotta walls, each of the small cottages featured a private terraced garden and projecting porch for lounging or outdoor sleeping. The Lewis Courts, one of his first “social architecture” projects, built in 1910. If you are ever in Sierra Madre, drive up Mountain Trail, almost to the top, and you will see them on your right. Mod: Interesting, right? Small homes versus those massive mausoleum looking things certain people think should be allowed here. Let's call that anti-social architecture. Today's post was put here in case you don't think there is something to lose tomorrow. Common sense was lost long ago. The Irving J. Gills style of archuture is beautiful and is a very good example of the past, what is known as tiny homes of today. The individual rental apartments all open to a large shared garden and shared swimming pool and common patio barbeque area. The Lewis Courts were way ahead of their time. The concept of community socialization vs the archuture of stack and pack development built around the metro line with shared gym facilities and shared metro bikes, can't compare. Individual property, is just that. Individual. The beauty is in the eye of the beholder, or buyer and builder. Good architecture and city planning make andifference in the quality of community and home life. Sometimes it occurs by accident, such as with the canyon (though it has some lousy architecture too). It can also happen with ‘stack and pack’ apartments by a rail line... if only that were the intention. Beauty is in the eyes of the beholder, very subjective. Says the person who never quite got past the 1970s. Hey man, all truth is subjective! How do you help turn Sierra Madre into something just like everywhere else? Elect Andy Bencosme. Preserve the preservationists thru cloning, then everything will be frozen in time. Spoken like a true pod. The unimaginative slander against preservation is to say preservationists are for no growth. It's called a straw man argument, yeah? I have a simple explanation for preservationists. Could it be that they are control freak? Not really arguments, 10:37. Control freak, no growth...is that really the depth of your contribution? We are discussing municipal policy regarding the quality of life in a community. Man, I'm just brainstorming here! I saw it - it was the same thing that showed up in the Tattler. It's not anti-Andy - it's truthfully listing his contributors. I saw it also. It listed his campaign contributors who are out of Sierra Madre realtors. Not anti anything....only who he listed on his election reporting form. How do you prevent turning Sierra Madre into something just like everything else? How do you prevent parcel tax and increased UUT? I believe the parcel tax will need to be passed by a 2/3+ 1 voter majority. I worry this election is much like the last presidential election. Everyone was sure Trump couldn't win, so he wasn't much challenged on his nonsensical positions and many Clinton supporters didn't bother to vote. Here Andy is running an issueless campaign that he has not been forcefully confronted on. Turn out is expected to be very low. Maybe Andy really is running to build name recognition for the next election, but he could still win this one. It could happen people. Make sure it doesn't. Go vote tomorrow. Low turnout might help the incumbents. The preserve people are very determined and will show up. Since Andy has not said much of anything I am not sure what is going to motivate his potential voters. Either way let's send the carpetbagger packing. I think you underestimate how unpopular the idea of moving the library was. Hopefully people are aware that Andy's support was key on moving the Library move forward. He flip-flopped much later. 8:50 Andy's voters and backers used to be called the DIRTS. They will vote. I didn’t get one. What did it say? Progress. The canyon area of town consisted of miners tents, the square footage remains today. In the 1970s the canyon was a run down eyesore of alternative lifestyles and drugs. Today, the canyon consists of expensive sought after real estate. I haven't seen many McMansions up there. Are you disappointed? Huge mansions are built everywhere: San Marino, Brentwood, Pasadena, etc. There's nothing wrong with huge mansions. Congratulations to the people who've made enough to build them. They just need to be on large lots, so that they don't tower over their neighbors. That used to be common sense. 8:54, you haven't looked carefully enough. There's more than one example of over-building that obliterated neighbor's property rights. This process is known as gentrification. There should be an ordinance that requires vanity castles be built on a lot large enough to accommodate a moat. I feel that my personal space has been violated too when some huge 6-plus-feet person towering over my 5-feet petite body. Do you have any solutions? Heels are not good for your back. Not miners tents. Historically incorrect. The small lot subdivision (same as in Silvarado Canyon in Orange County) were created for summer tent cabin recreation sites. As time went on the wooden tent floors sprouted solid walls, and roofs and expanded through a uniquely referrenced "paycheck lean-to" when you showed up with a little extra lumber and pushed out an additonal sleeping spot. The City Council asked for a group of vounteers to create a Canyon Building Zone and it accomplished many things that put a halt to the few "over-sized" dwellings you do in fact see up there. Floor Area Ratio and a building envelope requiring any house addition-second story-has to exist within a 45 deg angle drawn from a point 8 ft up at the property line. This effectively eliminates the second story from looming over the property line to the neighbor's house. Miners tents, the square footage remains today. Have anyone in the Planning Department explain this to you. The only thing that can save Delmar at this point is that she has been on every piece of No on Measure D mail and MVN ads so she got some free advertising from that. That's why Jose put out the card saying vote no on d...he didnt want people to think his absence from No on Measure D campaign indicated he was pro Measure D.
Jose Andy Bencosme pulled off the slickest trick of there campaign, the library flipflop. He might really have a chance solely because of that lie. And his running on the "He's a good father" platform. 9:58am. We all have voted Yes on Measure D, that translates as a NO vote for any of the canadite' s.
Our house also voted YES on D.
What I like about elections is that tomorrow night all BS stops and there are winners and losers. And the inept and cowardly Michael Alexander will have failed once again. Last night on his radio show he claimed he would have a Measure D proponent on the air (presumably Earl Richey or David McMonigle although dimwitted Alexander refers to his as McGonigle like the professor in Harry Potter). Never happened. These crackpots are in hiding. People are mad that an outside group is trying to bankrupt our city. You are lucky the signatures collected in 2015 to put Measure D on the ballot aren't public records. Lol 10:47am. People are mad that there is no accountability for the money collected from the UUT. People initially voted for the UUT thinking it would make a difference. Then the Sunset Clause was removed from the tax and the scare tactics continued by saying the city would cease it's existence and the city would shut down. Instead, most of the city employees retired or made career moves, taking their CalPERS package at the top level of earnings. New election year, same old scare tactics. 1:47am. What are you talking about? The signatures collected in Sierra Madre were from your fellow Sierra Madreans responding to their displeasure of how the funds have been used. More than enough signatures were gathered from your neighbors and friends asking that the initiative be placed back on the 2018 ballot for another vote. Our UUT was approved by over 71% of the voters. Earl Richey and David McMonigle have abused the initiative process, wasted our time and created fruitless community strife with what is obviously a personal vendetta and crackpot scheme to financially stress our town. They were people responding to your continuous dimwitted "analysis" like comparing us to La Canada without including La Canada's police and fire expenditures paid to the county. 12:20pm. Unclear of your thoughts regarding 10-20% increase in property values. Are you of the mind set that the government should take more of your earnings by way of increased taxes? Content but vigil makes you sound fiscally responible. If this is the case,then would you be willing to explain how paying out extra taxes which have not been designated or do not show how they are accounted for under any of the city expenditures, how does this help the town? Please provide citations to specific expenditures that are not accounted for. Or are you making it up? Don't waste your time. Most people can't even balance their check books. Didn't think you could 5:02. Bleating about a forensic audit in the absence of articulable facts of unaccounted expenditures is nothing more than simple minded bleating. Pay your taxes for the services and infrastructure available to all, cheapskate. I am not who you are so upset with, and I did not vote for Measure D. But when a city pays interest only on water bonds for almost two decades, and racks up millions in unnecessary debt by doing so, then yes, we do need a forensic audit. And a City Council with the nuts to do one. Listen to yourselves, do you even know what is a forensic audit? You still haven't explained, 7:46, why do you need a forensic audit when in your own post calling for it you already said exactly where the money went. You can certainly dispute the wisdom of an interest only loa, but that doesn't mean the payments toward that loan are not accounted for. Do I know what a forensic audit is? Yes, I do. It is a criminal investigation. That water bond disaster is a crime. Maybe you'll feel a little better, 7:46, knowing that when the principal payments begin in 2020, the $6.75 million principal to be repaid will already be worth less than $5 million in 2003 dollars and well less than that amount by the time the final payment is made in 2034 (not counting additional inflation to be caused by Trump's inevitable wrecking of the economy). Yes, but a lot of people paid a lot of money that they didn't have to pay. Nobody has ever been held accountable. We have earned a perp walk. Bart first, followed by Stockley and Hayes. If it's a crime, name the criminal statutes violated, the acts that violated those statutes, the persons who committed those acts, and facts demonstrating the requisite mens rea of those persons. Just saying something you don't like is a crime doesn't make it so. You still haven't articulated any crimes committed by them, unless you want to criminalize council votes on matters with which you disagree. But, geez, I thought your St. Ronnie defeated those who sent political prisoners to the gulag. I voted for Obama twice, and Clinton over the Orange Madman. I didn't vote for Bart because he is a Republican. Same reason I didn't vote for that worm Bencosme. As far as the question of whether the bond mess was a crime, well, wouldn't that be the reason we need that forensic audit? It's the invention of compound interest. Nothing more, nothing less. If u think the city made a bad finance decision, then re-finance it. 8:37, what is your voting history has to do with fraud? It was the use of public money to fund the water infrastructure for the DSP. Something that was never shared with the rate payers of Sierra Madre. Then when Measure V sent Bart's Boobdoggle to the landfill, payments weee switched to all interest because that supposed downtown goldmine couldn't be built. Big old crime, and somebody needs to do the time. 8:43 - somebody earlier accused me of being a Reagan fan. I was offended. 8:38--8:22 didn't say it was a bad financial decision. And it's not compound interest. 8:34 Is @@ a typo or reference to what has become for Trump a Stormy Monday? If the latter, I like the not so subtle subtlety! 8:48 Do you have a wall with photos, maps, minutes, push pins, and yarn? 8:48 - Somebody is getting freaky with you. The office of Trump's lawyer Michael Cohen was raided by the FBI today. Michael Alexander just barricaded himself in his office. Apparently it's Stormy Daniels related. Stormy is going to save America. She definitely has a smarter lawyer. Told you that $130K these days don't go to far, especially after tax. Ballots returned through today indicate that turnout will be 10% lower than in 2016. In 2016 3,000 people voted and this time we are on track for 2,700. Predicting that 1,200 absentee ballots will be counted tomorrow followed by 1,200 polling place votes followed by 300 or so absentee ballots counted next week that were mailed in tomorrow or turned in at the polls on election day. Goss and Arizmendi are in a battle for first place (in 2014 Goss beat Arizmendi by 38 votes). Arizmendi will likely beat Goss this time around because the advantage he had in 2014 (he had name recognition from his failed run in 2012) is no longer a factor and Goss has been significantly outmailed. Bencosme needs to be beating Delmar by 75 votes when the absentee votes are reported sometime before 9 pm because Delmar will likely do better with poll voters than she will do with the absentee vote. If Bencosme loses the absentee vote he will lose the election. Our long local local nightmare will be over in 28 hours. Measure D will get only 23% of the vote and fail. When you place a Measure on the ballot that basically says 71% of the voters were wrong for voting Yes on Measure UUT just two years ago and providing zero evidence why they made a mistake and then allowing your cause to get taken over by dimwitted oddballs from out of town it's not going to end well for you. Nostradamus predicts: Measure D - YES vote will usher back common sense spending. Just about 24 hrs until Bulldozer and Chandler go down in flames. A lot of old myths about Sierra Madre are going to go down with Measure D.
A lot of old lies about Sierra Madre are going to go down with Andy Bencosme. Election day is tomorrow in Arcadia and Sierra Madre, but the top story on the Pasadena Star News website is it's kitten week. Anyone old timers around that would remember the artist-printmaker Bernhardt Wall? He lives at this place and made a micro etching of it in a ‘little’ book he published in the 1940s.